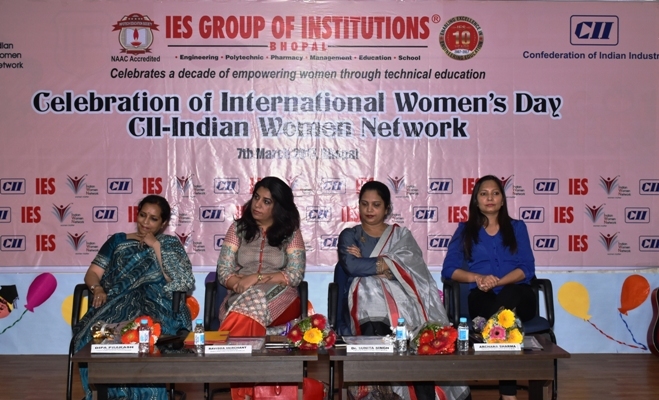 CII Indian Women Network, Madhya Pradesh has organized a session on “Women Leading Change” to celebrate the International Women’s Day on Tuesday, 7 March 2017 at IES Group of Institutions, Bhopal. Ms Archana Sharma said that Change is change…how good or bad that depends on us. Change starts from within and the root to anything and everything is our thoughts. The call of the time says that we need to work on ourselves and clean ourselves. To implement this, here comes the concept of Thought Technology. Our thoughts are like BIG data which needs to get channelized. Thought technology is the art and science of thinking. It basically increases the thinking capacity of people which enables them to deal with tough and crucial situations of life. People generally take thinking for granted as they consider it to be a natural process. We are always taught to study, to behave, to speak……but not to Think !! Positive thinking helps us to create wonders in terms of physical, social and mental aspects. To students. She suggested the formula of 3 Ps to select their career. Ms Dipa Prakash said - women are miraculous and flexible, I see women everyday who are capable of doing any work in this male dominated world.” The message for young students regarding the empowerment of women was highly applauded by the student members. Ms Ravisha Merchant said – Perseverance pays. Women should persevere to follow their dreams and not give up to achieve their goals. Dr Sunita Singh said - A well literate woman is an empowered woman. Why do we need to celebrate a Women’s Day, every day is a women’s day. *Ms Dipa Prakash, Chairwoman, IWN MP *Ms Ravisha Merchant, Co-Chairwoman IWN MP *Dr Sunita Singh, Group Director, IES Group of Institutions *Ms Archana Sharma, Thought Technologist, Roccia Bliss.